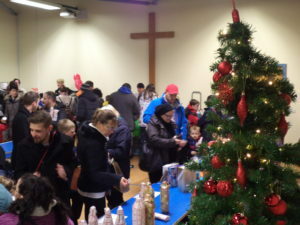 Thank you to everyone who came to Christmas Fayre! 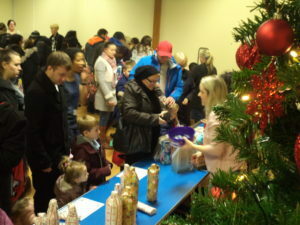 A big thank you to everyone who supported our Christmas Fayre on Friday 8th December! Lots of families came along and went home loaded with goodies! 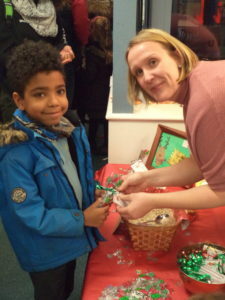 The children enjoyed taking part in the activity stalls, and meeting our special guest; Father Christmas! Despite the very cold weather we were extremely lucky to have the choir singing Christmas Songs in the courtyard and they entertained our visitors to the fayre! A massive thank you to all FOSA team, and staff who helped prepare the fayre, run the stalls, and the big tidy up afterwards – we could not have these events without the volunteers who give up their time to help. All the raffle prizes that were not distributed on the day have been given to the children to take home – or winners have been notified – and thank you to all the companies that have donated the fantastic prizes! To name a few: Boost, West Lodge Farm, The Hub, the Elwes Arms, Hullaballoo and Tesco.